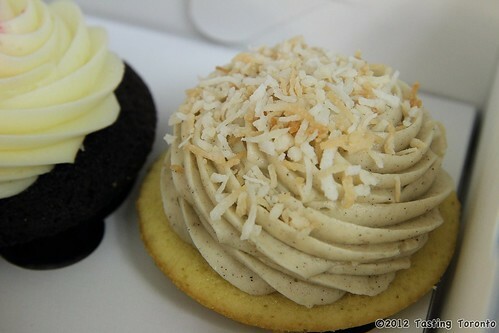 I've had their cupcakes and they are my favorite in the Toronto area. You are right on point when you say the peanut butter icing is to die for. The Chocolate Peanut Butter is my favorite by far with the Chcocolate Peppermint coming up pretty close. PGB's icing is perfect, not too sweet or too buttery and the cake, it's also perfect! Hi Leesh! Oh yes, the Chocolate Peppermint is also delicious - I think I'm in agreement that that is my second favourite next to the PB icing! Now I'm craving another visit to PGB since there were a few other types I've not yet tried! i walked by the location in 1st canadian on v-day and the line-up was INSANE! i've had vanilla on vanilla and peanut butter on banana. both delicious! I really like the icing on Prairie Girl's treats but find the cake part a bit dry. Isn't it weird how there don't seem to be dozens of cupcake shops in Toronto? They're a welcome addition! Mmm - those look amazing! I wish there was one near me. I guess that's what I get for not living downtown! Now I'm craving cupcakes!